There was a press conference organized by the Managing Director of Jannat Valley Ms. Shweta Sharma, along with Karan Arora and Rohit Bhadana. In the press conference at NIT 5 road situated Hotel Golden Tree Managing Director cleared every hoax. During the conference, they gave pivotal information and showed some valid documents to the media. There have been media stories about Jannat Valley and few other farms like Khalsa Farm, Yogi, and Eden Garden at Surajkund Road who are in the business of conducting weddings and other functions. They further informed the media that Jannat Valley not only has always been a safe venue but also an ideal venue of choice for conducting weddings and other functions; situated at prime location on Surajkund main road, opposite Manav Rachna International University and surrounded by foothills of Aravalli with lush lawns and hilly landscape, this wedding resort can cater for all types of occasions whether for a large gathering or a small get-together. Jannat Valley’s lease owner ‘Wedding Park Hospitalities Pvt. Ltd’ and its Managing Director Ms. Shweta Sharma, who recently took over this premise for nine years has given new look to Jannat Valley, Ms. Shweta with her extensive experience of more than 12 years in the hospitality & entertainment industry along with her team has completely renovated the place and made it the most desirable wedding destination on the Surajkund belt. 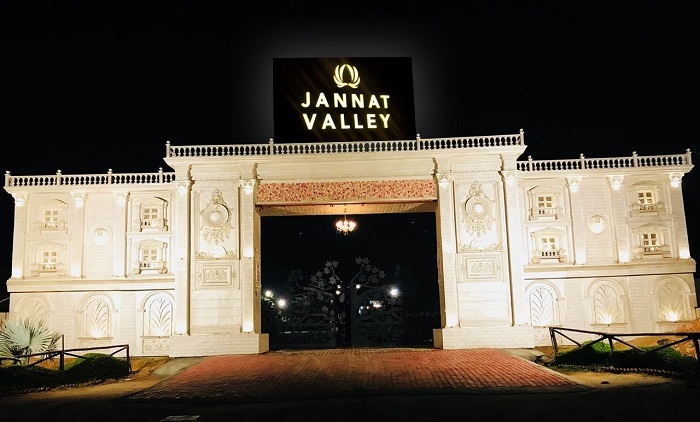 Jannat Valley now has four magnificently designed venues within its vicinity; each with a variety of set-up & themes, offering all comforts & luxuries. Along with state of art Décor and naturally created blend of rocks & greens unfolds the raw ambience and feeling of Jannat in its true sense; A Jannat which is 20 minutes’ drive from south Delhi, 15 minutes away from Faridabad city and 35 minutes from Gurgaon. The farm also has a large capacity to accommodate parking of up to 1500 cars within its vicinity along with the valet services.